Nebuchadnezzar (neb yoo kad NEZ uhr), the king of Babylon, had died. A few other kings ruled after him, and then Nebuchadnezzar’s grandson became king. His name was Belshazzar (bel SHAZ uhr). 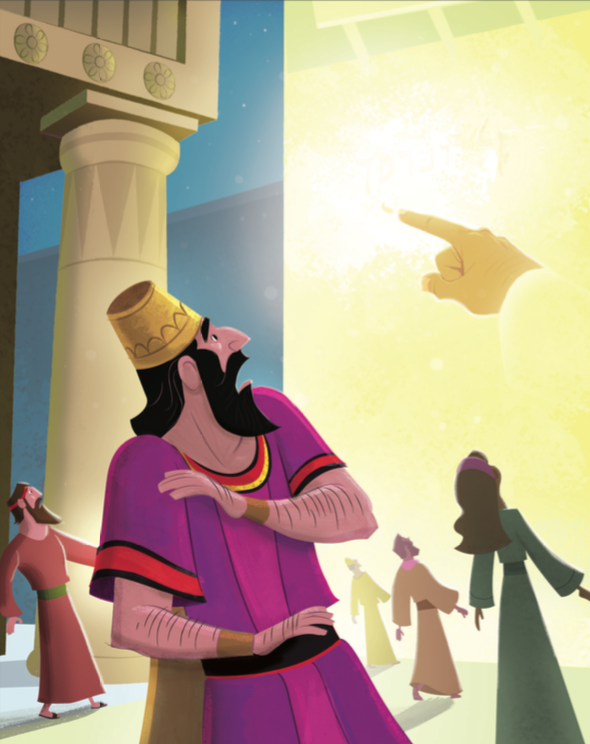 King Belshazzar had a big party—a feast! He invited a thousand people, and there was plenty of food and drinks for everybody. King Belshazzar asked for gold and silver containers. The containers had been taken from God’s temple in Jerusalem. The king and his guests drank from the containers. They were misusing them. The containers from God’s temple were not supposed to be used for drinking at parties. While they drank, the king and his guests worshiped their false gods— gods made of gold, silver, bronze, iron, wood, and stone. Suddenly, the feast was interrupted. A man’s hand appeared at the wall, and its ngers began writing a message on the wall. The king watched the hand, and he was very afraid! His face was pale, and his legs shook. The king looked at the message on the wall, but he didn’t know what it meant. “Bring me the wise men!” the king ordered. “If anyone can tell me what this message means, I will give him gifts and an important job in my kingdom.” The wise men came, but none of them knew what the message meant. King Belshazzar and his guests were upset. Then Daniel read the message. The words on the wall were MENE (MEE nih), MENE, TEKEL (TEK uhl), PARSIN (PAHR sin). Daniel told the king what the words meant. MENE meant that God had counted the days of the kingdom. The king wasn’t going to be king anymore. The next word, TEKEL, meant that God had given the king a report card, and he had failed. The word PARSIN meant that Babylon would be split up and taken over by two enemies. 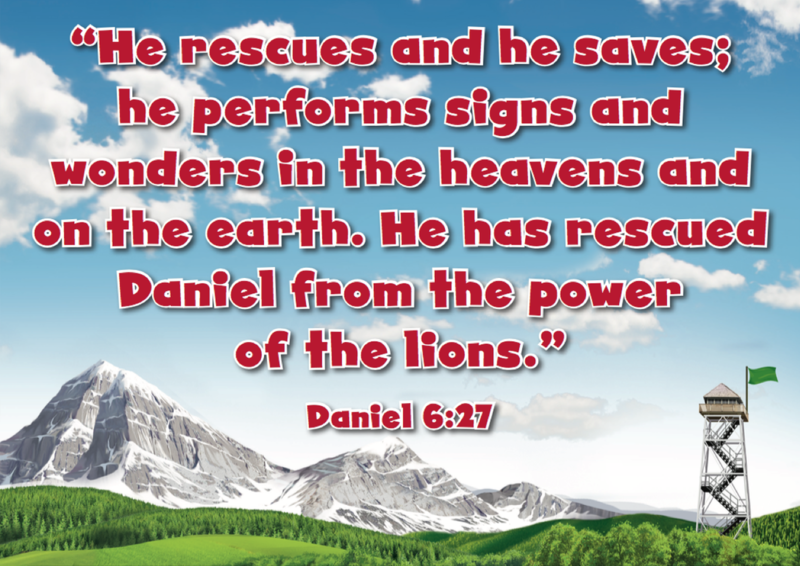 King Belshazzar gave Daniel gifts like he had promised, and he gave Daniel an important job in the kingdom. That night, God’s message came true. King Belshazzar was killed, and a new king named Darius (duh RIGH uhs) took over the kingdom. Christ Connection: God used Daniel’s wisdom to get the king’s attention about his pride. The king acted like he was better than God. 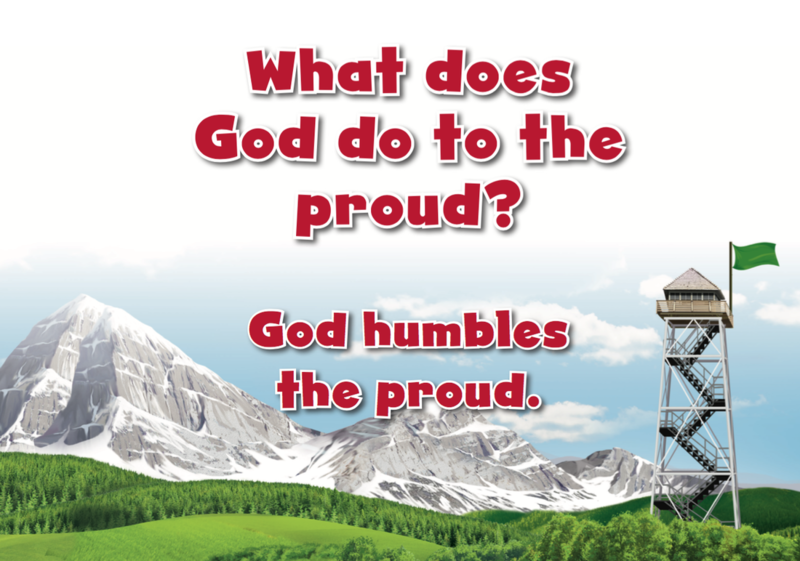 God humbled the king. Jesus humbled Himself by dying on the cross for our sin. God raised up Jesus and gave Him honor. When we humble ourselves and trust in Jesus, God will raise us up too, and we will be with Him forever in heaven.